Use only the specified brake/clutch* fluid. (Refer to “Recommended lubricants and capacities” in section 8.) Never mix different types of fluid. 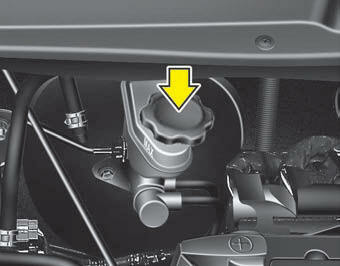 When changing and adding brake/clutch* fluid, handle it carefully. Do not let it come in contact with your eyes. If brake/clutch* fluid should come in contact with your eyes, immediately flush them with a large quantity of fresh tap water. Have your eyes examined by a doctor as soon as possible. Don't put in the wrong kind of fluid. A few drops of mineral-based oil, such as engine oil, in your brake/clutch* system can damage brake/clutch* system parts.